In Him... : Fallen from Grace? It is interesting to me that as we grow in the Lord, often things we were taught as early in our walk turn out to be not only unscriptural; but we discover that the actual meaning of the scripture(s) is completely opposite from the way it was taught. Take for example, the idea of "falling from grace." 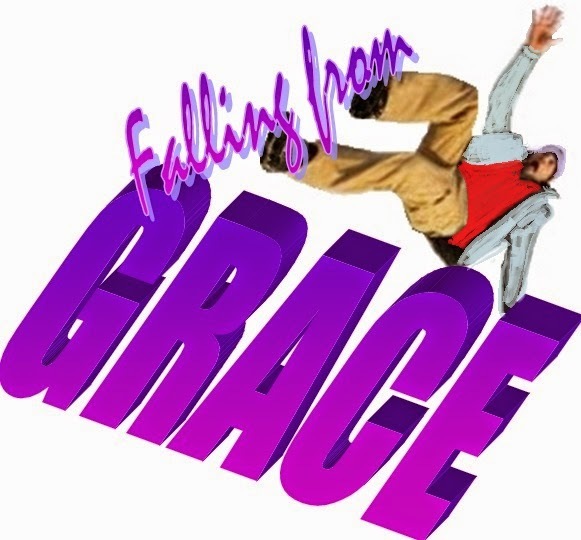 I can remember being taught that falling from grace meant that someone had just sinned so much (too much), that there was simply no more grace available to help him or her. It was even taught that there are just some people who test God's grace and patience so much that He just has to give up on them and therefore, they "fall from grace." Of course, the church I was part of back then, seemed to focus more of its efforts on preaching against sinning and backsliding than teaching about following Jesus. They taught very little about His grace, what and who we are in Him, or about loving people and helping to reconcile them to God. There is one passage in the entire New Testament that mentions the idea of "falling from grace! Paul is specifically saying that a person who is trying to be justified by the law, and not by the blood of Jesus, has fallen from grace (ekpipto charis). It is the not the person who has fallen back into sinful living or depravity that has fallen from grace. No, the sin that causes someone to fall from grace, is the sin of trying to add one thing - one law - to the precious blood of Jesus and His finished work on the cross! The Apostle Paul says it is the person who is no longer trusting in the grace of God alone, but is relying on righteousness through the law (or anything that is being added to the blood of Jesus). That is the person who has fallen from grace. Trying to add one thing to the grace of God is like adding a drop of blood from a bull or a goat to the blood of Jesus! Not only is that completely unnecessary and disgraceful, but it defiles the work of Jesus. You cannot add to a finished work! The danger of falling from grace is in trusting in anything other than the blood of Jesus for salvation and righteousness (right standing with God). The gospel message is pretty simple, because God did not want it to be complicated. He did not want us to try to earn our way to Him through works-righteousness, then that would have voided the gift of grace. The simplicity of grace is found in Romans 10:9-10: "If you declare that Jesus is Lord, and believe that God brought him back to life, you will be saved. By believing you receive God’s approval, and by declaring your faith you are saved." I love how the God's Word version of the bible translates the word "righteousness" as "God's approval." Think about that one for a minute! No one has God's approval without the blood of Jesus. The moment a person tries to earn God's approval by following the law, they have fallen from grace. It is God's grace that keeps us. It is only what Jesus accomplished on the cross and none of our effort that took away our sins and keeps us righteous.